The exact origin of the Molotov cocktail is unknown. Over the last fifty years it has been the single most popular weapon of insurgents worldwide. As a rule, it was a weapon of last resort, as one can always find bottles and a liquid that will burn, no matter how tight the restrictions on more conventional arms are. Various armies have taken note of its effectiveness and have, at least, instructed their troops in its construction. Some have gone a step further and attempted to develop Molotov cocktails as production items. Various types of fuzes have been tested, but none have been particularly successful. 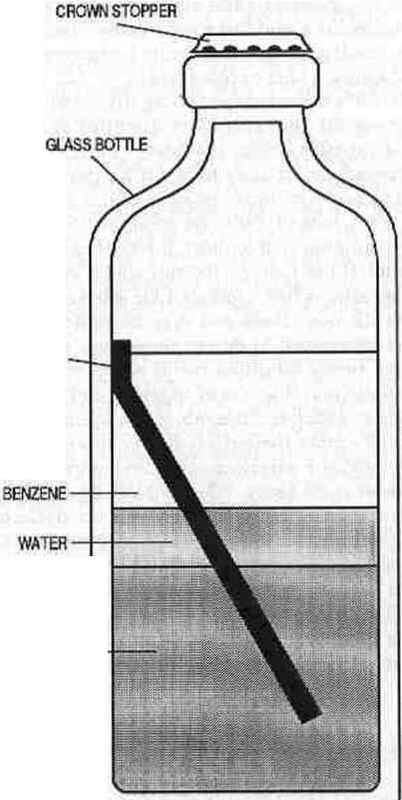 The following section contains three kinds of fuzes—chemical, mechanical, and chemical-mechanical. They are representative of types used, ranging from bad (No. 76 GrenadeJ to excellent (Fieser Incendiary Grenade), with a stop in between for marginal. They give a reference point for where we have been in the past and where we may go in the future. NOTE: Credit for the invention of the seif-igniting firebomb may well go to the Fenians, the nineteenth-century forebears of today's ERA. "Fenian fire/' as their particular version was called, consisted of white phosphorous dissolved in carbon disulfide. Bottles of this liquid were thrown down chimneys or through windows to set houses afire. 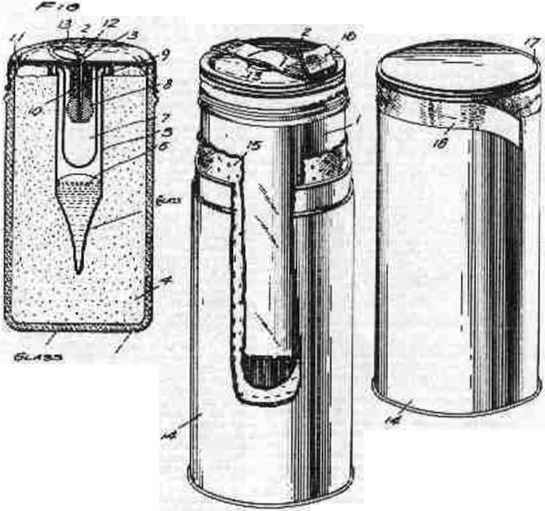 The SEP grenade was a Molotov cocktail-type weapon developed early in World War 11. It consisted of a common 1-pint glass bottle containing a mixture of benzene, water, white phosphorus, and a strip of raw rubber. The rubbeT strip became quite soft and sticky from contact with the benzine, and this gave it some adhesive qualities in use. Ideally, the grenade ignited spontaneously when hurled against a tank or other target. The SIP's manufacturer originally intended to use it to demonstrate the incendiary qualities of his mixture, but it apparently caught the fancy of certain higher-ups, who ordered the military to test it for possible adoption. It was tested by various branches of the British military, all of whom hated it (with no small justification, I might add—if you drop it, it ignites). It finally came to rest with the British Home Guard, who received it enthusiastically. They had always had a soft spot for weapons of this type. The SIP was cheap and easy to produce, but it had several drawbacks: 1) due to its design, any accidental breakage during handling could prove disastrous; 2) at low temperatures it was slow to ignite: and 3) 1 pint is too small for an effective firebomb. It was spectacular, smoky, and usually quite ineffective. It was also adopted by the British army as a substitute standard weapon until something better came along. When something did. it was discarded as soon as possible, but it was not declared obsolete officially until 1944. In anticipation of the German invasion that never came, the Home Guard buried caches of these weapons, which still pop up at the most inopportune times. It usually occurs when a bulldozer is clearing land for a building project and rips up the cache. This is what we in the business call a "surprise." No. 76 Self-Igniting Phosphorous Grenade, actual size. This device was developed by the Japanese for the primarily jungle combat of the Pacific Theater of Operations. Due to the lack of many things hard enough to break the bottle in the average jungle, they reasoned that an impact ignition fuze would be most effective. The fuze itself consisted of a brass body containing a striker/percussion cap assembly, a hair spring, and a safety nail. 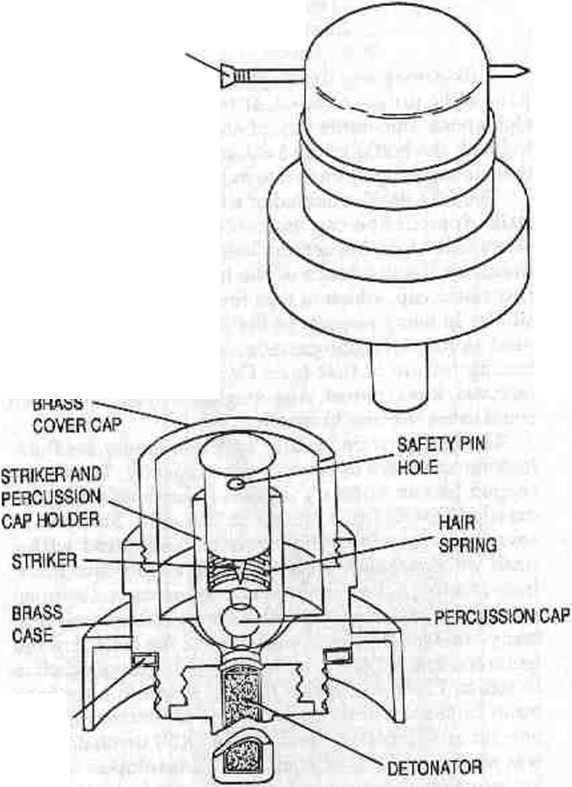 Upon impact, the inertia of the striker would overcome the resistance of the hair spring and fire the percussion cap, which in turn fired the detonator. It was similar in many respects to the British "All-ways" fuze used in the Gammon grenade, but it lacked the delay arming feature ofthat fuze. Once the safety nail was removed, it was armed. Any rough or sudden movement could cause the fuze to function. The bottles were usually supplied empty for field-loading and were of about 1-pint capacity. They were shaped like an ordinary Japanese beer bottle and had detailed instructions pasted on the side. Shipped in cases of twenty-four, they were also supplied with a small wooden funnel for loading and twenty-four fuzes, individually packed in small aluminum cans. Captured examples were tested and proved to be unimpressive. In many cases the detonator would break the bottle but not ignite the fuel. High explosives are not always effective in setting fire to Gammable liquids. It would have been better to use a slightly larger charge of firecracker flash powder as opposed to the tiny (1/4 "XT) detonator that was employed. This type of fuze, if developed further for improved function and ease of manufacture, could be very useful. Japanese impact ignition Moiotov fuze. 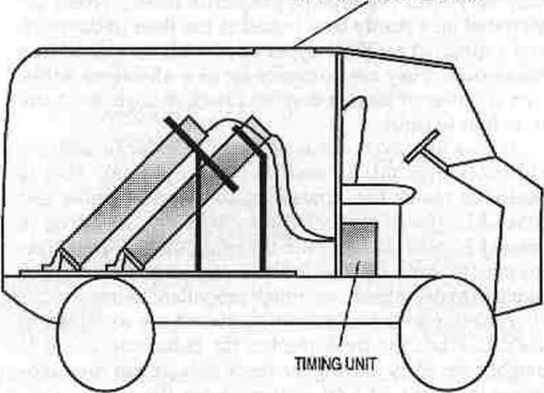 This device was invented by the same design team that developed the original napalm filler for firebombs. During a trip to Aberdeen Proving Grounds in late 1941, Dr. Louis Fiesar, head of the team, was impressed by the large air intakes on a (then) modem tank. He reasoned (rightly) that a well-placed firebomb, dropped on the engine deck, would cause it to stall, fill the interior with smoke, and possibly set the lubricating oils on fire. Though it was noted that American tanks were more vulnerable in this respect than their German counterparts. development was started in early 1942. The device they came up with—and later patented—was one of the best of its type. It was safe to handle, easy to use, and, best of all, self-igniting. Rather than use white phosphorus (WP), as the British did in their No. 76 grenade, it was decided that diethyl zinc would be more suitable. This material will ignite spontaneously in air at temperatures much lower than WP. A small number of grenades were made for tasting by the army but were turned down as "unsafe." Though this grenade was as safe as it is possible to make this type of weapon, it faded into history. According to Dr. Fieser, the text of the patent is the only report on this weapon still in existence. He covertly provided the details of its construction to the Haganah in the period immediately before the Israeli War of Independence, but no details of its employment are known. L.F. Fieser et. al. incendiary grenade. U.S. Patent filed February 21, 1944.
lJ0:ir Finer. 8r«®cnl. ttiA, Cljifr C Htm*. XVll»!nft-:n. Rmûrjmt B HrnfeBers. TV Irvrnáion íUc-jJ!«», r.r*«:a nu? h* «nmru-laef «r<«' a"id for ihr Oavtni^ant tnr intmpMoUl r/urpaaci wtgwrt rhn payment ^ m n? -«rytHy Iwfca. Hvi lover.Ucn reiaui ¡^tMrolmiy 'o «.n ln»n-i! ry rrrnarr adapted 1er Ihtcwirn nr fcux! Aoc i>h.î<; t»f UlU tr.vemlon li te prever ■r. Inctr JUrr r.rrn«.> vMeh, upci rr:?.vica :Ctr-rp: l-npjur^ vhea ättocc. b qulcl" lo *rtlno n«r. ai eatxtawly Jow («r.parafeiru. A fura:îr b lo prwtóe i muol'-lcr. fe 'W le Tiar'ilACturf. vídclJ CSTI be M* fMTW with rMKxriW® rnfpt? uní «rdcJ ^«o Ii shl> reliable ^rfonrMK«. ccnAÖe sjarmhltd It! prc*dint culos $ruj w.f?. i a jUftmm to Ûif «K funlni.r.rly id nn'jret I and : the fori cotia w/ I I' » 2lui jmr ïiwdtt a canaidirc' «tbnar. S pint lo tîKHil «ni» e/jart. o^Ulne- U made Crom » SruifiMe aste.-lai aL*nrcm<.9i«1> tu : jeu-V» djïb crrtaî.n pebl e. f., until droftw^ "¡ fw4 ^r\to a birtfVM nnor wPîtq Cikd. Otcqueiril or. -Jhe otaide Aâel-rM^^rt tu vida. Lftd M». : pu»—V.uw^Mir toiip r,t îoeewr. ftll aeldi nr xUsr.lnum UumU I part—Mufltinwn na?hthrtia^ A rUoi anipool* • la di&mcc wj'ii ar. :rn*t¿nr «r. Sole which la vcr.ta&toiptr Inrasmabla tr, ali. A prrtcrrrd îype al inccrâlary tüíl h • pit a'Wcr. u Qtafclâ'ttlMQBtoflU* a ti.-npcniiure une» L-tan —4C'm * u> T. *> m to U capibée Cf u.v fr, c3:it»u> ran«lut /toa lha cnid rqdoha irf 3- A.i*iJk lo ihi tnmteo. Tho ¿nie sftault1. biîf v catueono »am a:: jen îw 00 día: unan Ihrr rj-lke a lárice a-ty »'.U uàî^ie and i»o tha rioa>«t /. preferred type ef inenmdiuv far na* as a HLlac ta lie precid* la dtscrtlwit Oio t copcr^ltai" appdciW., 6rrt?J 306,535, AM Mcv^r.l^r I. Xhia typa oi cH cmr. t'tiara a inutuio al ahiaatnun ^Bpi uC fiiîy acïd? zaô «.luoltam ac*& af aap.ithanic ai-.^'or una«uiraieá fil^y acldi Xn tiMiiar, lo maraci -o\Uo<3a<;üaVí:rm>;:t laclvan U îfce unlL 4â ihc -capf. Ibe ?cl5e<S taaohoe may cnraW ¿Oler Fer exemple, tûe srrla* ae pitara unAa such aa .anp kltrfc or waal Oeur. Vat pralicrktr In carrying, tne creuade U p&M tr n meCAl cotiairitr y raUng il, rjch a? a t;o car. k i|h a forr.igatod paprr *Jner A Ut) 1« cf xtrent tapo I? pwldrc to ptamir «asr aithdtaaaJ c.# li^e p-'naTti ¿nú bIsû w cover lae talcai -pln JV^U rln* II b;uJ Ibwrby present l'ir aeeifîrrto'. 0t pr^maUirr wl'Jidiawxi of lha tant. pc:rbou»d ano lha 11**. T.i» IhlCkmel. KHlVKl Oí aoUdtte«! l'irl íiür.c IT-ir be ir.adlflea U- accelerate ite l^oJ'Jar., partiiuiarly wlurn ;l ta le be ujed :n a crerade at entrer*' y law Mm-ar, petLtuiea acoompdia^ ciiy mcctWcatlon. «1-Htlnu of crrmlr. lour fir« peint auv.utr.re* was ac ue¿ e. g, tilUraled alcabc j. jy?reaidn, pc'.r-free airlt'jr and i:i|n-.U:'r «Tbm iftjeh iddl^vea ouï t«' toc -.n/atlk and nw r>f fp aa/slf mi^M trl-Ji the (ce:. ar -.i itan bondlw! rtmnbtj a-Uhant ccnrcrr. :o aMeh pn^tCra iCin trwtt fKurity b lo thip th^ i; j iwi t-:ec¿rd? iwt nfT rtfln (trr; íar arsm «r:í »1*2:10« bal «IL1 ttw proper ameran! Maman u> avo'.d fcac&rfot ftaxjwui- a«U3 tiU DO^ » rtl**ûM Inlc ar. ancec ftod tûe uvajmS*? -«fil*«» » prräeterrüoeU «Uguate impact. ^ttftiM SBbodaWJU othet n»od flca^OU- irw.ni -Jfi fci rtnwrml ol to# coi'^r pia. How to make homemade percussion caps?